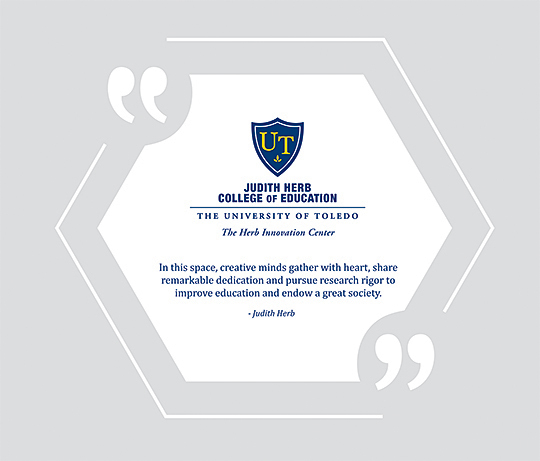 The Judith Herb College of Education will dedicate a new center Thursday, Oct. 4. The mission of the Herb Innovation Center is to evaluate and inspire peer-reviewed research in the college to improve and advance education and endow a great society. UT alumna and benefactor Judith Herb will be at the ceremony. In 2006, Judith and Marvin Herb, and their sons, Thomas and Jon, contributed $15 million to fund numerous scholarships as well as educational assessment support and research initiatives in the College of Education. The Herbs designated $8 million of the gift for the Herb Scholars Fund, with another $4.25 million going to support the Herb Research Initiatives Fund, which bonded together researchers with a common interest in learning. The remaining $2.75 million funded the creation of a faculty development and electronic assessment support system fund. Additionally, to recognize the single largest donation in school history, the college was renamed in honor of Judith Herb. The ceremony will be held at 4 p.m. in Gillham Hall third floor lobby. A short ceremony is scheduled for 4:15 p.m. with an open house to follow. RSVPs are requested by Friday, Sept. 28; go to utoledo.edu/education/dedication. This entry was posted on Wednesday, September 26th, 2018 at 11:53 am and is filed under Uncategorized .